Sixty years ago, Ernest Wilson wrote a book called Aristocrats of the Garden . (8) Less than ten pages were devoted to azaleas, and all but a few lines were about deciduous forms. Although he was aware of the broad world of azaleas of all kinds, the evergreens were dismissed because they were "unfortunately not quite hardy in New England." His base of study was the Arnold Arboretum where Jack Alexander in 1978 noted over eighty evergreen varieties in the living collections. (1) The interest in deciduous cultivars did not languish either, for a walk past the main buildings of the Arboretum today brings one to many large specimens. We azalea lovers are blessed with horticultural forebears in many countries who imported, hybridized and propagated this remarkable shrub which has multiplied into the many beautiful forms described recently in Fred Galle's elegant and enlightening tour de force. (4) Because of collectors, nurserymen and landscapers, these plants are widely available and used throughout much of the Northeast, consequently we have gained considerable knowledge of their potential and limitations. Presented here is one man's opinion, backed by many consultations with others, of how far we have come in growing azaleas east of New York state during the past sixty years. Hardiness is still a prime concern of anyone growing azaleas in these parts. The growers and sellers who have given their azaleas considerable time and investment must take care to avoid leaf, bud and twig damage. Their containerized plants are particularly susceptible to the nuances of the weather for they are coddled and forced with water, warmth and fertilizer to speed growth and to obtain a leaf form that is turgid and shiny. These plants have little more leaf and twig resistance than a marigold when there is an unexpected significant drop in the temperature at any time of the year. Sellers also want to market azaleas that will not disappoint buyers because of their failure to bloom and thrive. The average home grower is looking for a pretty plant that is ironclad. This person has little thought of experimentation or later replacement. The avid gardener wants something special and will take a few chances. The collector not infrequently is a gambler. All these people take into account verbal and written information as well as personal experience when considering the hardiness of a potential beauty for their environs. The information presented here has come from several sources. The literature has been scanned. Hours have been spent with collectors, growers and hybridizers. They have the most insight into the future. Retailers and landscapers have been helpful because they straddle the great divide between producers and consumers. Information from wholesalers is important because they stand to lose the most on a mediocre plant. The data has been divided according to the hardiness zones shown on the map published by the U.S.D.A. Agricultural Research Service (Fig. 1). 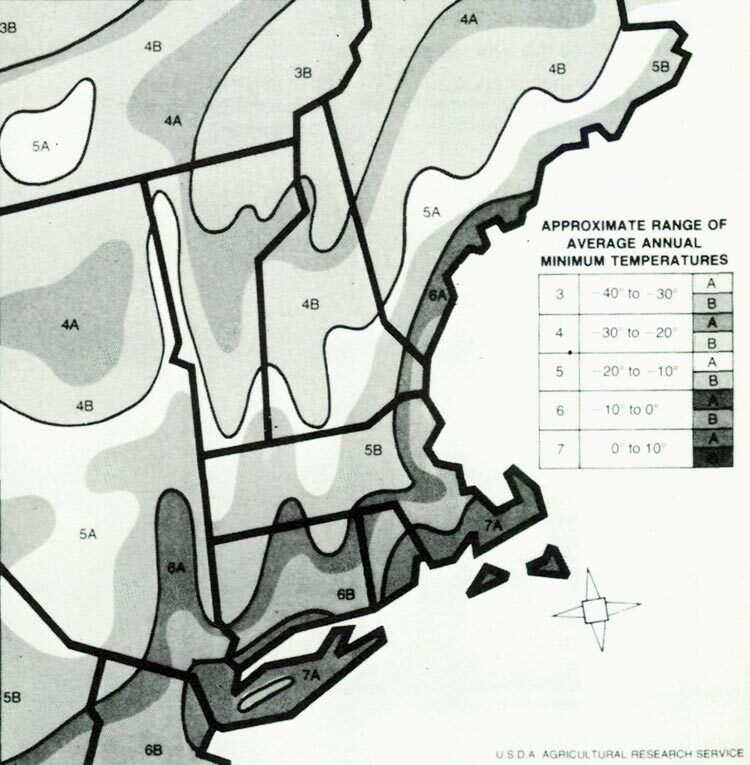 These zones undulate widely in central New England which makes it difficult to give an opinion on hardiness without referring to the map, furthermore, recommendations do not take into account the microclimates of a particular area. At this writing, no data was available north of Zone 4B, but some must exist. The information for Zone 4B is scanty and as far as can be determined, there are no "good doers". (Table 3) The usual low temperatures in winter range from -20" to -25" F. This is not conducive to growth, and when the temperature dips to -30" twice in ten years, blooms are hard to find. (2) Some plants bloom only after milder winters such as we have had recently. So far, there is little enthusiasm for Northern Lights and Abbott Hybrids even though the latter originated in Vermont. Now that this is in writing, it is hoped that someone will come forth with a well documented contrary opinion. In Zone 5A, there is reserved enthusiasm. This comes from wholesalers and retailers. They are constantly pressing growers and hybridizers for new and better plants. Lincoln and Timmie Foster in northwestern Connecticut note good hardiness and blossoming in many low growing evergreen azaleas. They have particularly good results with the taller Arnold and Kaempferi Hybrids, some of which are their own. Almost all of the deciduous varieties flourish. Winter temperatures there of -15°F are to be expected. Over many years, Horatio Bisbee who lives in central Massachusetts at Ware has been acquiring, growing and noting in detail the progress of his azaleas. He has contributed his material to this report. (Table 4 and 5) He is particularly fond of 'Placid' because of its green foliage all winter despite occasional -18°F temperatures. 'Viking' and R. tschonoskii are also favored. He has done crossover studies with azaleas, switching them back and forth in alternate locations to note progress, regress and progress without obvious cause. This information gives good reason to move a plant to a different site when it is languishing.(3). One cannot pass through Zone 5B (Tables 6 and 7) en route to 6A without mentioning Edmond Mezitt of Hopkinton, MA. For many years he has been collecting and hybridizing azaleas on a large scale, and his Weston Nurseries have extensive growing areas. Among his favorite evergreen cultivars are R. kiusianum 'Album', 'Pink Discovery', 'Pink Clusters', red and orange forms of the Poukhanense hybrids and popular items such as 'Stewartstonian', 'Lorna' and 'Delaware Valley White'. The hardiest Gables are 'Springtime' and 'Herbert'. There is occasional mention of North Tisbury Hybrids in this zone. Almost all of the deciduous azaleas are hardy, and it is here that Mr. Mezitt has engaged in considerable hybridizing. Since spring blooming cultivars abound, his interests have turned to the rest of the blooming season. For June there are the Arborescens hybrids with their colors, fragrance and striking fall foliage. In July there are Viscosum (spicy fragrance) and Bakeri Hybrids. August brings the Prunifolium hybrids that bloom for up to four weeks. 'Lobster' is outstanding. Most of these have brilliant yellow, orange or red foliage in the fall. For those wishing May bloomers his Jane Abbott hybrids. ( R. roseum x Mollis) are recommended. These are similar to the Northern Lights Hybrids of Minnesota. All of these hybrids have little or no mildew leaf problems common on Ghent, Knaphill, Exbury and Mollis hybrids making Weston hybrids more satisfactory as leafy plants. Zone 6A is a narrow one, and there is little that can be found that is specific to this area. Its importance is that it extends well northeast along the coast of Maine. There are many plantings of deciduous and evergreen azaleas in Camden. These are shipped there from the south. No growers are in evidence probably because of the short growing season. There are many active growers in the Zone 6B of Connecticut with large plantings for the wholesalers. It is common to see fine specimens tagged with the sign "Connecticut Grown". Although container growing is more common, field plantings are evident in the Connecticut River Valley and the eastern part of the state. Much of eastern coastal Massachusetts is in this zone and that includes metropolitan Boston (Table 8). Azaleas growing successfully in the Arnold Arboretum reflect those that will thrive throughout this zone, and these have been reported. (1) All the plants mentioned in the zones to the north will grow faster, larger and bloom more consistently in 6B. Good growths of North Tisbury Hybrids have been reported by inhabitants of Boston suburbia. A wide variety of azaleas can be grown in Zone 7A, (Tables 9 and 10), which extends along the southern coast of New England. It includes all of Cape Cod and the adjacent islands. There is more interest in evergreen azaleas here. Mr. Lorenzo Kinney of Kingston, Rhode Island, with the assistance of Miss Susan Gordon, grows 600 varieties in his fields and has been doing so for years. On Martha's Vineyard is Polly Hill's nursery from which come the North Tisbury hybrids and other selections. From Greenwich, Connecticut to Cape Cod there are many containerized nurseries both retail and wholesale that sell azaleas. They also obtain excellent stock from New York nurseries on Long Island. Although there may be dieback with some plants after hard winters, few plants are killed. Gartrells (Robin Hills), Linwoods and some Satsukis do well, but they must be protected when small. It is well to cover them with a white plastic cloche from late December to mid April. Because long warm autumns are common, a sudden drop in temperature can cause bud blasting. Early bloomers can be affected by late spring frosts. These cold catastrophes are not as common near the ocean which tempers the swings of temperature. In fact, the blooming season was perfect in southern seaside Massachusetts while there was a lack of blooms around the District of Columbia in May, 1985. Strong winter and spring winds, however, have an adverse effect on foliage. Glenn Dales, Gables, Kaempferi hybrids and Girards do well, but Back Acres are not offered locally. North Tisbury Hybrids do well, especially near the sea, but like the Satsukis they must be protected from rabbits and voles. Small plants are particularly susceptible. Netting, poison baits and spraying with a suspension of Thiram or "Hinder" (ammonium soap) during the winter months can prevent damage. Gables are subject to Ovulinia, but this blossom blight is not as common as observed in and about the District of Columbia. Some of us have observed that late bloomers are among the hardiest both in bud and plant. (Table 11) They may bloom when the winter is severe, and they are less affected by late spring frosts. Some Satsukis perform better than recommended in the literature or by hearsay. Many of them are among the better winter foliage plants, and they are very attractive in rock gardens. To many, good foliage is important. This is what is seen the year round and this is what gives texture to the garden or foundation plantings. In my area (7A), all surviving evergreen azaleas keep their leaves to some degree during the winter. Many have definite winter and summer leaves, the latter being larger. Some winter leaves keep their summer green. Others take on shades of red or bronze that revert to green with the warm winter. Listed in Table 12 are cultivars that have particularly attractive foliage. Those in my plantings have maintained good leaf form despite hurricane Gloria (October 1985) which blew for four hours off the sea with no rain. There was considerable salt deposit, and a bite into an apple felled by the wind was most distasteful. The salt resistance of all my azaleas was better than expected and none succumbed. In general, different hybrids of azaleas respond differently to weather conditions. To insure good overall results, it is best to have more than a few cultivars. In Zone 7A, there is less interest in most of the available deciduous azaleas such as Ghents, Knap Hills, Exburys and Mollis because of leaf mildew. The colors are great, but the plants may not be attractive in featured areas during the late summer and fall. When I was a boy, I frequently traveled south to visit my grandmother in Washington, D.C. At that time, it was the only place that I saw cardinals and mocking birds. Now in southern Massachusetts, I see cardinals daily at my feeders, and I am frequently wakened by my mocker in the morning. It is my hope that the azaleas that I have caused to migrate from the environs of the District of Columbia to this clime will do as well for years to come. 1. Alexander, John H., III, "Evergreen Azaleas at the Arnold Arboretum, "The Rosebay", Vol. VII, p. 1, Spring, 1978. 2. Barber, Dean, Concord, N.H. Personal communication. 3. Bisbee, Horatio, Ware, Mass. Personal communication. 4. Galle, Fred. C., Azaleas , Timber Press, 1985, 486 pp. 5. Harding, George, Germantown, Md. Personal communication. 6. Holt, M.A., Pellett, N.E. "Cold Hardiness of Leaf and Stem Organs of Rhododendron Cultivars", J. Amer. Soc. Hort. Sci. 106:608, 1981. 7. Mezitt, Edmund V., Hopkinton, Mass. Personal communication. 8. Wilson, Ernest H., Aristocrats of the Garden , The Stratford Co., 1926, 312 pp. Dr. Findlay is a member of the ARS Azalea Committee. He has been growing azaleas and gathering information on their culture in New England for over a decade.